The new CL_SPU_USB + BLDRV3 driver cards replace the older BLDRV2-24 cards and are now recommended for new systems. A limited number of older CL_SPU & BLDRV2-24 cards are still available for customers who wish to add cards to their existing installations or as spares/replacements - please contact me for details. BFF modular brushless motor driver for self-build flight control loaders. The CL_SPU_USB and BLDRV3 cards must be "engineered" into a properly designed and constructed Control Loader (FFB) system. Please read all the project information listed on the BLDRV3 page and FFB Yoke page BEFORE ordering cards. 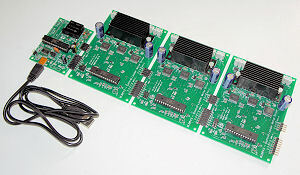 The CL_SPU_USB & BLDRV3 cards are available as special order items (despatch is typically 1 to 2 weeks following order). To order cards please email me at the email address below indicating the number of cards required and the destination country. For small number orders I will then send you a PayPal email invoice detailing the total cost (including standard airmail delivery to non-UK destinations). Secure payment can then be made through PayPal using the links on your email invoice..
For a single pilot station installation, 1 x CL_SPU_USB is required, PLUS 1 to 3 BLDRV3's - one for each flight control axis (motor). For overseas orders P&P will normally vary between GBP 15 and GBP 20 (including insured airmail to non UK destinations where available) depending on the number of cards ordered. UK delivery P&P will be about GBP 10. There is no VAT payable on these orders as BFF Design Ltd is not UK VAT registered. Additional software licensing charges apply for commercial use of the BFF CL software (please contact me for details). Customs or other import charges/duties on deliveries to non-EU destinations may be incurred - I am not able to predict what these will be and the customer is fully responsible for meeting them. I am able to provide a reasonable amount of free email technical support for card customers. However there are practical limits on the total amount of support time per order the relatively low sales price of the cards can cover. For non-commercial home-use customers I can provide, free of charge, a cumulative total of two (2) hours of technical support time per order. Subsequent technical support time will be charged at a rate of UK�40 per hour (for support provided during normal office hours). If you feel you may need more than 2 hours of technical support time then please contact me before ordering cards. Please read all the project documents and satisfy yourself that you can manage the work required in building your CL controls BEFORE purchasing cards and attempting the project. Despatch: is usually about 1 to 2 weeks after order placement; I'll let you know if there will be any delays before ordering. Note each card is made and tested to order and this takes a bit of time. Terms & Conditions: Please read the Terms and Conditions BEFORE ordering. Please read the important note above on technical support. Delivery Times: Typically 5 to 10 working days after despatch - however this will vary with destination and the usual delaying factors (holidays, customs, local conditions etc). NOTE: I normally supply the driver cards only; to complete the project you will need to source for yourself all other components required for the system. Suggested brushless motors are given on the driver card page. I am not able to confirm if brushless motors other than those specified in the plans and documents are suitable for use in a CL system. If the motors you wish to use do not have sinusoidal back-EMF characteristics it is unlikely that they will provide smooth enough force feel. I can't tell if they have these characteristics without physically testing them. The CL_SPU_USB cards have a "Discover" mode of operation which can be used to identify appropriate EEPROM settings for non-standard 3 phase motors - contact me for details. A BFF CL Software non-commercial home-use licence is included with the price of card orders (one per pilot station). To unlock the software on a specified PC you must run the software then follow the registration prompts and email your PC ID to me. I can then send you the unlock key for that PC. Please contact me if you wish to use the BFF CL drivers and software for commercial projects. Copyright � 2012-18 BFF Design Ltd All Rights Reserved.